In the Autumn i like to go to Grenville-sur-La-Rouge and drive the dirt road along the Rouge River, it’s a beautiful place ! Along that river there is also smaller rivers and i always look at them to see if something interesting is worth shooting. This shot was taken when the sun was high enough to illuminate the yellow leaves of distant trees that reflected on the water surface. Taken with Canon 7D + 400mm/5.6L + a 20mm extension tube, tripod. This entry was posted on October 13, 2014 by Steeve Marcoux. It was filed under Weekly photo and was tagged with autumn, beautiful place, grenville, smaller rivers, the Rouge River, weekly photo. Lovely and so fresh! 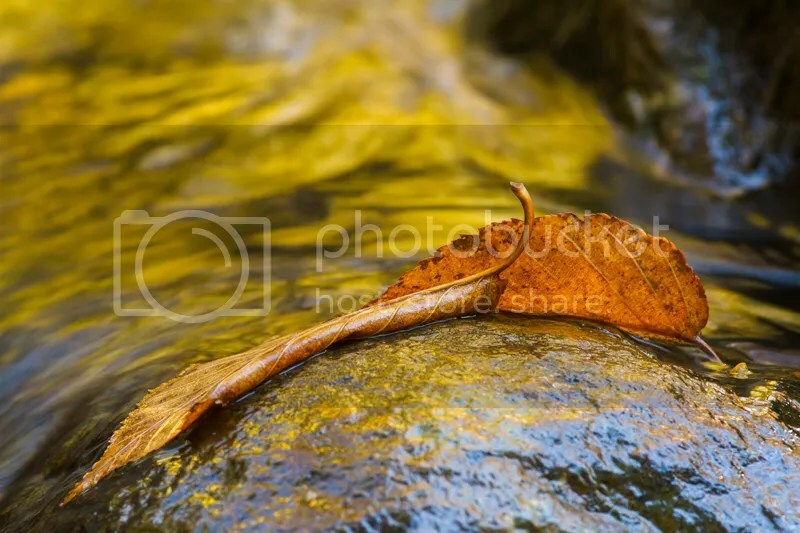 The leaf seems to be just chilling out lazily on the rock. The Canon 7D does it again – as well as the skills of the photographer of course! Well captured! you’re right, it seems to be chilling !